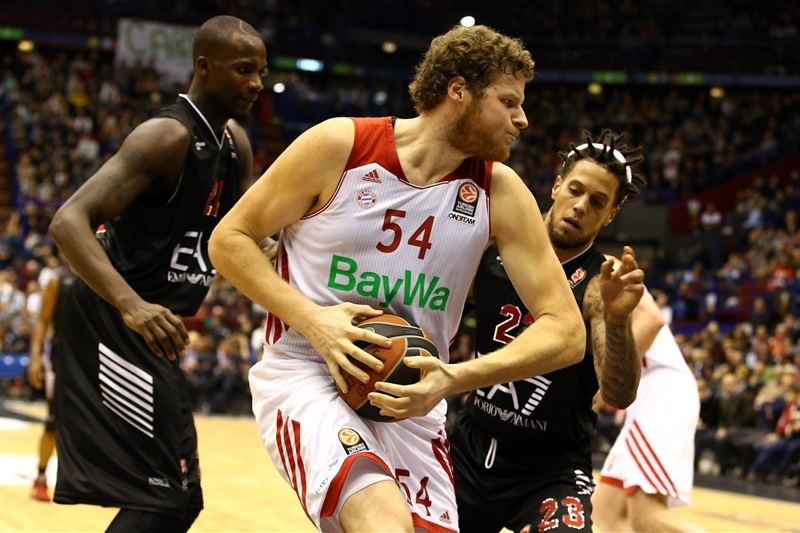 Hackett's game-winner lifts Milan, eliminates Bayern! 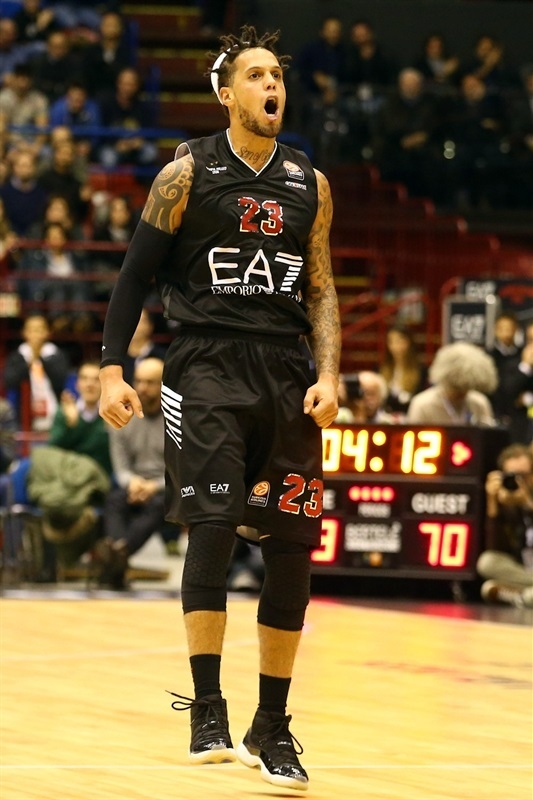 An incredibly tight game to open Round 8 of the regular season early rewarded the home fans when Daniel Hackett buried a deep two-pointer with 1.5 seconds left to give EA7 Emporio Armani Milan an 83-81 victory on Wednesday and to leave FC Bayern Munich out of the Top 16. Milan raised its Group C record to 3-5 with two games left in the regular season, while Bayern fell to 1-7 with two losses to Milan, meaning certain elimination. It was a dramatic finish to a dramatic game that saw 23 lead changes, 11 in the final quarter, and nearly as many ties. 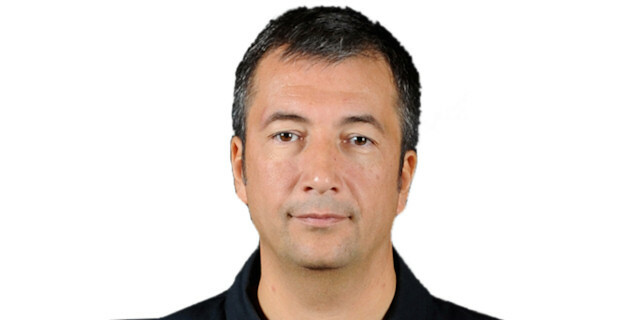 Bayern lost head coach Svetislav Pesic to two technical fouls by halftime and assistant Emir Mutapcic finished the game for the visitors, who led last after 2 free throws by Bo McCalebb with under a minute left. Both teams missed after that before Hackett took matters into his own hands, staring down defender Anton Gavel before rising with his foot on the arc to hit the shot and send the Mediolanum Forum crowd through the roof. 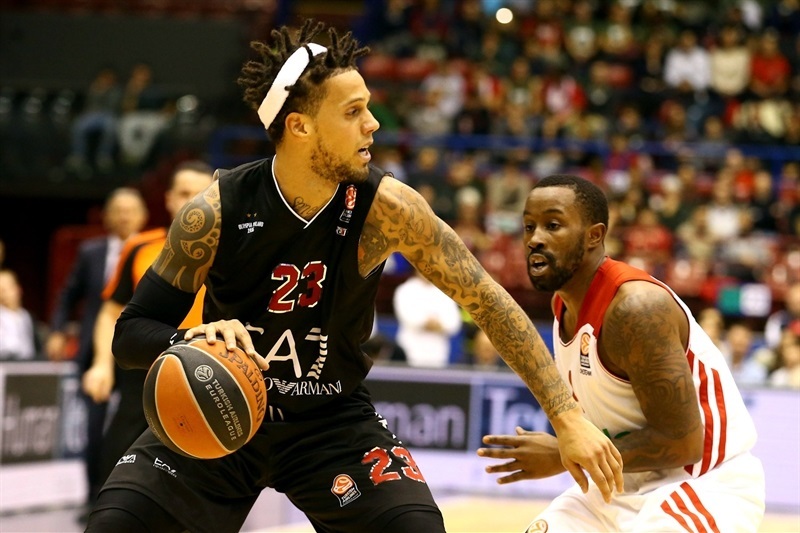 Hackett scored 22 of his game-high 25 points after halftime to lead the winners. 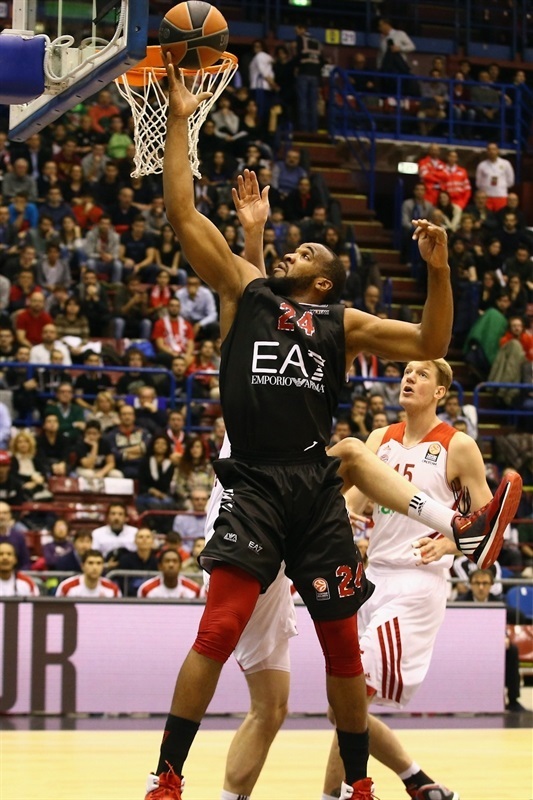 Joe Ragland followed with 13 points and combined with Alessandro Gentile for the first 16 of the game for Milan. 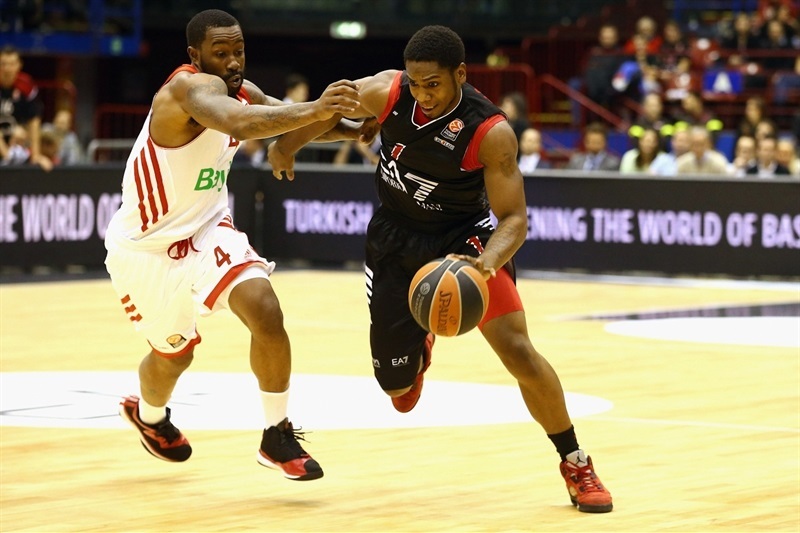 Linas Kleiza added 13 points and Samardo Samuels 10 for the winners, whose 11 three-pointers made to just 6 for Bayern made the difference. Bayern went down swinging with 15 points from Heiko Schaffartzik, 13 from Nihad Dedovic and 11 each from Dusko Savanovic and John Bryant. 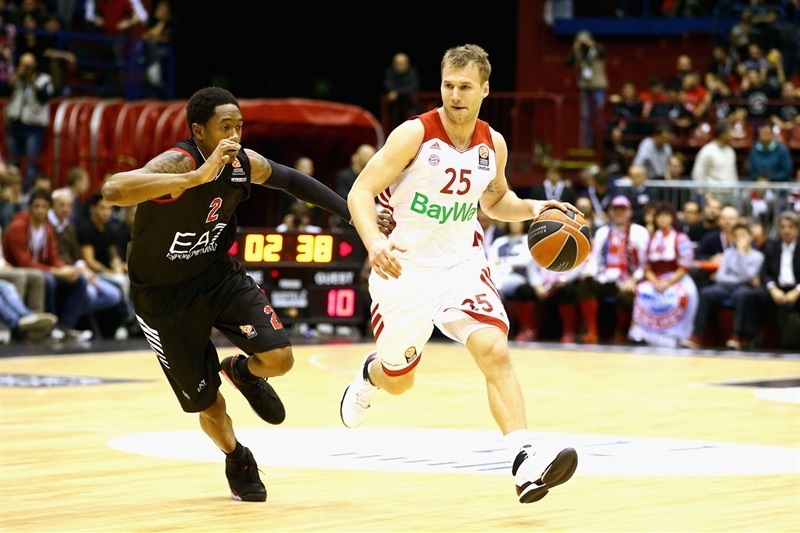 After the regular season ends, Bayern will continue its season in the Eurocup Last 32. 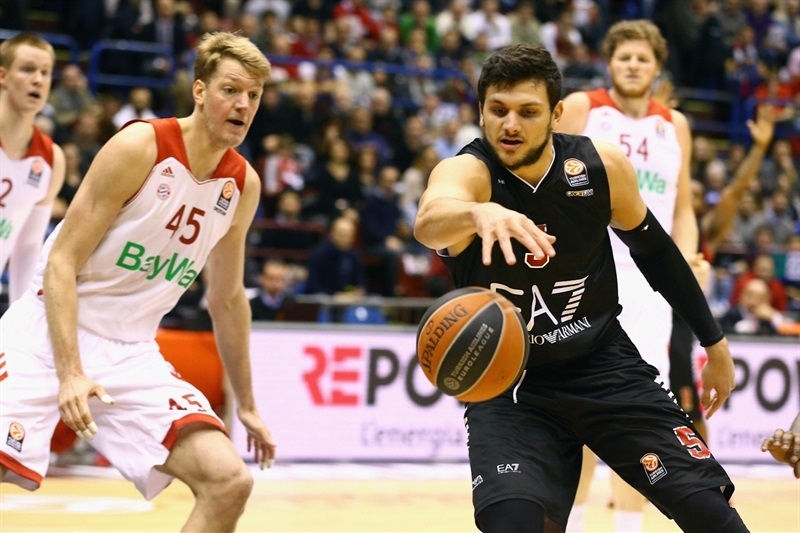 Dedovic scored a layup off the opening tip to put Bayern on the board immediately. As Bayern's defense held strong, Bryant dropped a hook and Dedovic fed him for a basket to make it 0-6 and force an early Milan timeout. An offensive rebound led to the hosts' first basket, a jumper by Gentile, then good ball movement found Ragland for a triple and a 5-6 scoreboard. Jan Jagla answered with a jumper that Gentile matched at the other end. Milan found Ragland open again, he stuck the triple and the hosts had their first advantage, 10-8. Robin Benzing's first basket tied the score, but only until Ragland made 1 of 2 free throws and drove for a layup at 13-10. Anton Gavel answered with a free throw and his second, a miss, was put back by Vladimir Stimac for another tie. 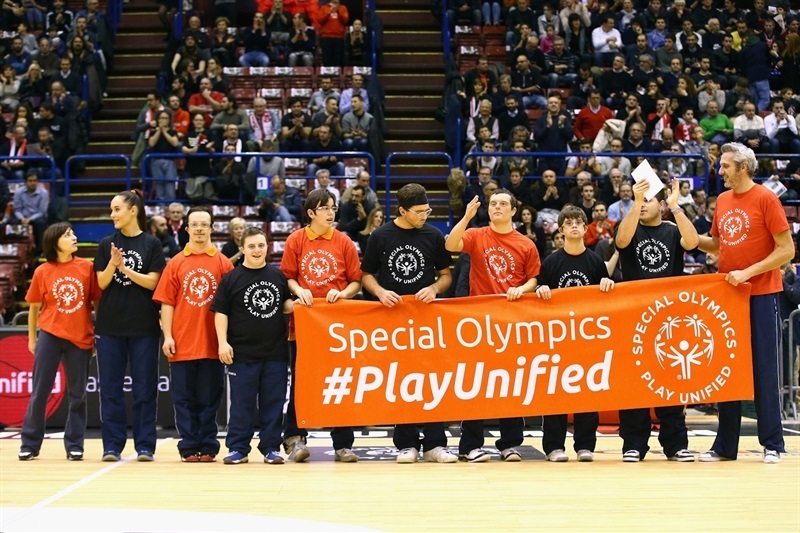 Gentile's basket and free throw supplied a new Milan lead that Savanovic matched with Bayern's first three-pointer at 16-16. Ragland went up to 11 points himself with a go-ahead layup and Gentile made it 20-17 with an acrobatic shot, but Anton Gavel outdid him on a buzzer-beating runner to end the first quarter 20-19. Schaffartzik climbed off the bench to give the lead back to Bayern with a layup to which Gavel added 2 free throws to make it 20-23. Savanovic kept the beat with a baseline jumper, forcing another Milan timeout. 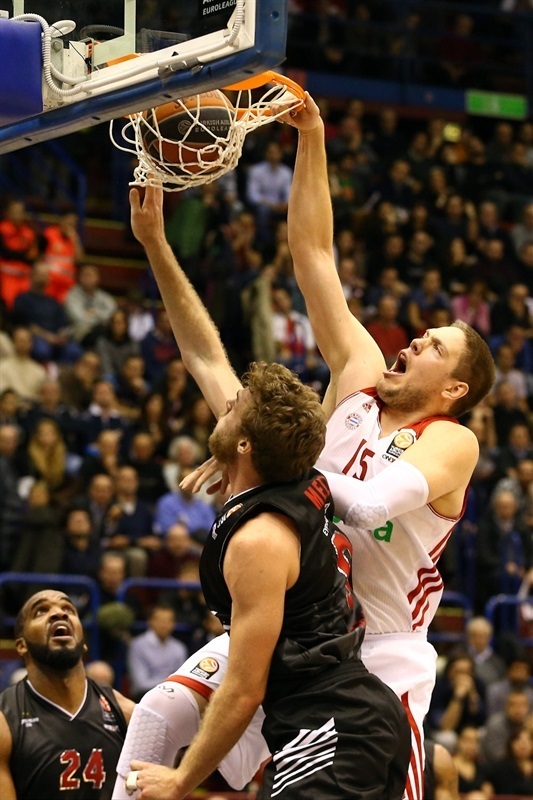 Kleiza re-started the Milan offense inside, but Schaffartzik answered with his own acrobatic layup at 22-27. David Moss struck from downtown for Milan and Hackett, liking the idea, buried his own for a new lead change at 28-27. Kleiza came up with a big block, after which a technical was called on Bayern head coach Svetislav Pesic. Kleiza missed the free throw, but soon took his turn with a triple to complete a 9-0 Milan run to a 31-27 lead. 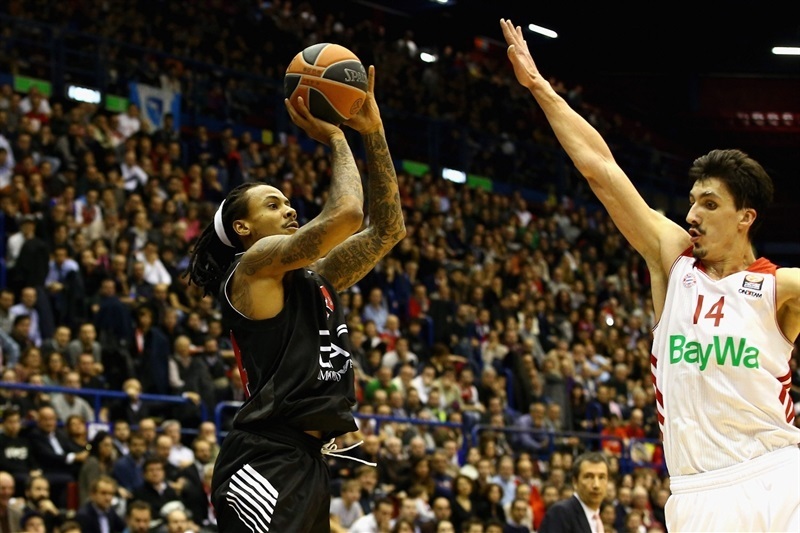 Jagla stopped it with 2 free throws and yet another unlikely Bayern shot was made by McCalebb to tie, but Samuels joined Milan's three-point party to restore the lead at 34-31. Benzing made a reverse put-back, also rather acrobatic, and Kleiza answered the Milan way, from downtown. But this time Benzing was ready on the arc, and his shot gave way to Schaffartzik taking the lead back at the free throw line going into halftime, 37-38. It was then that Pesic had words with the referees, was whistled for his second technical foul and, as a result, disqualified. Ragland made the technical free throw to start the second half with a new tie, 38-38. Hackett put Milan back in front with a pair of inside baskets before Dedovic answered from long range to make it 42-41. Ragland's follow-up was matched by Djedovic on a drive. McCalebb drove next for a go-ahead basket although Hackett's free throw quickly tied 45-45. Gavel stepped up then with a three-point play for the visitors. After a Milan timeout, Samuels scored in close, drew Bryant's fourth foul and hit the free throw to tie 48-48. 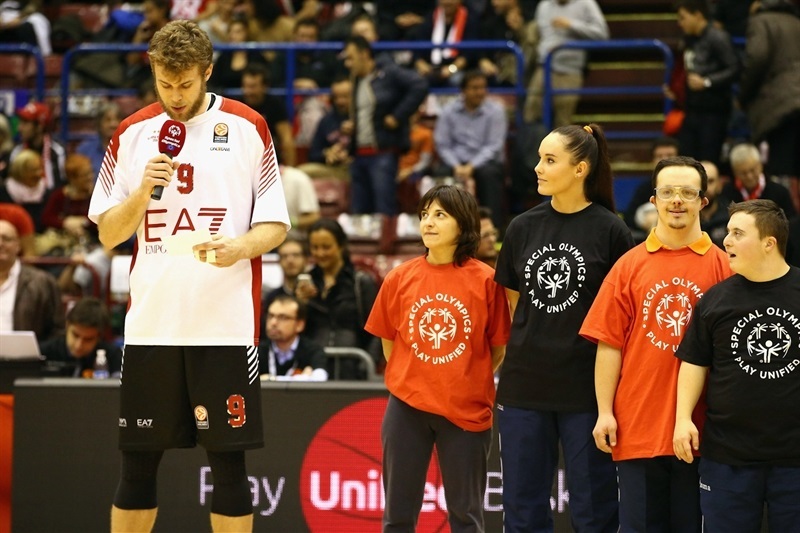 Savanovic broke the tie from the lane, but Nicolo Melli matched him with a long two-pointer. Moss followed with a three-pointer and free throws to make it 55-50, but Schaffartzik responded from deep - and he wasn't done. Next trip down, Schaffartzik faked a defender and buried his shot from even deeper, putting Bayern back in front, 55-56. Melli's 2 free throws meant another lead change, as did those by McCalebb and Samuels, while Jagla missed one for a 59-59 tie. The foul line parade continued with Schaffartzik making 1 of 2 for a 59-60 Bayern lead after 30 minutes. Dedovic made a tough shot inside to boost Bayern's lead before Hackett erased it with a triple for yet another tie, 62-62. A second-chance triple by Kleiza jacked Milan back in front, 65-62, while Schaffartzik got 2 points back on a nifty drive. Samuels got a rise out of the crowd with a fall-down put-back that Dedovic matched at the other end. Savanvoic then got to the free throw line and was perfect for another lead change, 67-68. Hackett turned for a jumper to change it again, as did Dedovic with free throws and Kleiza with a stop-and-pop jumper now with less than 5 minutes left. The big defensive play came from Shawn James, rejecting McCalebb, then going the other way to feed Hackett for a layup. After Kleiza fouled out, Bryant hit a foul-line jumper at 73-72. When Hackett rocked a jumper from the arc, Bryant copied him at 76-75. Savanovic got to the free throw line to put Bayern back ahead, 76-77, with 2:08 to play. Hackett and Bryant traded baskets next, then Hackett made the second of his pair of free throws for a 79-79 tie. With a minute left, Hackett's fadeway on the baseline put Milan in front. After a timeout, Bayern went to McCalebb, who tied at the free throw line. Moss missed from the corner and McCalebb on a drive, giving Milan the last possession. Hackett stared down his defender and unleashed the game-winning shot, straddling the arc. It fell through with 1.5 seconds left to eliminate Bayern and give Milan fans dreams of the Top 16. "This was the game that we were expecting. It was the last call for Bayern, so they never gave up. Our game was quite good, but not enough to create a big advantage or control and manage the game. I appreciate the desire, the energy and the humility my team used to win this game. Our future is in the next two games. We won this one, but we have to make a better effort next week to beat Panathinaikos, and again in the last week against Turow. 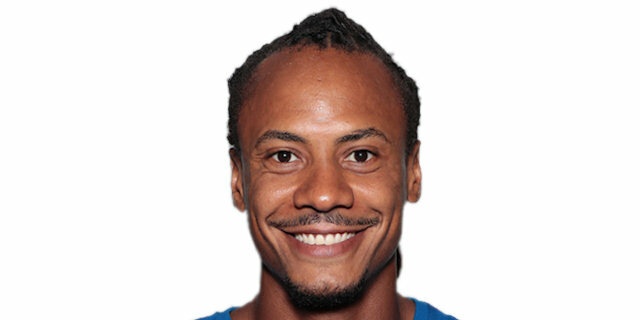 This is a very difficult group, like never seen before." "It's Euroleague basketball! Both teams fought. Both teams needed a win. Luckily, we had that great big shot down the end and pulled it off. I just got back playing after a rough moment for me, and it was good to be back on the court here with my second family."